Indonesia will announce tomorrow the results of one of its most important presidential elections in recent history, measured in terms of global climate change. While it's safe to say few Americans are aware of it, Indonesians have already cast votes for one of two starkly different candidates. One is a former furniture salesman, beloved by the middle class, who has pushed through significant reforms during his tenure as Jakarta's governor. The other is a multimillionaire ex-general with a questionable record on human rights, although some view him as the leader more able to unify the archipelago nation of more than 17,000 islands. Domestically, the winner will guide the continuing evolution of the nation's fledgling democracy. But from an international standpoint, there's a great deal at stake for the climate. Indonesia's future president will take the helm of a nation that recently supplanted Brazil as the world's No. 1 deforester. The widespread logging and burning of the country's carbon-rich tropical forests, often to make way for vast oil palm plantations or mining operations, has made Indonesia one of the world's top emitters -- by some estimates only falling behind China and the United States. 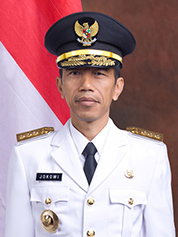 Joko Widodo. Photo courtesy of Wikipedia. Many environmental advocates have already pinned their hopes on Joko Widodo (or Jokowi, as he's commonly called), the populist candidate who appears to be narrowly winning the election. Glenn Hurowitz, head of the conservation group Forest Heroes, said the election's result could be "a true watershed moment for Indonesia's forests." "You have one candidate who has put good government at the center of his platform," Hurowitz said, referring to Jokowi. "You have another candidate who has tied himself to the status quo of Indonesia's transactional politics and has associated with some of the past failures ... that have led to deforestation on a truly massive scale." But others aren't so sure. While both Jokowi and his opponent, Prabowo Subianto, have stressed the importance of protecting the environment, neither has said much of substance on the subject. "Frankly speaking, not much mention has been given to climate change in the election," said Wimar Witoelar, an Indonesian political commentator, Jokowi supporter and former spokesman for Indonesian President Abdurrahman Wahid. "The issue got lost among other things." Seen from 30,000 feet in a commercial airliner bound for the Pekenbaru airport, located on the Indonesian island of Sumatra, the view shows neat rows of trees -- either palm or acacia -- blanketing the landscape below for as far as the eye can see. What at first might appear lush and tropical is instead a succession of massive agricultural plantations. On the ground and a five-hour drive north of Pekenbaru, the area near the city of Dumai is a frontier of forest conversion, a wide expanse of land nearly devoid of vegetation. This barren terrain will soon become dense groves of oil palm or acacia. Over the past two decades, Sumatra's tropical rainforests -- among the most biologically diverse in the world -- have been converted into monocrop plantations of oil palm, used as an ingredient in myriad consumer goods like ice cream and cosmetics, and acacia trees, which are pulped into paper products. In Indonesia, loggers often slash and burn the forests to make way for plantations, which releases the carbon sequestered by trees into the atmosphere. Much of Sumatra's forests lie on deep, carbon-rich peat soils. When these are burned or drained, even more carbon dioxide is emitted. Indonesia's outgoing president, Susilo Bambang Yudhoyono, pledged ahead of the 2009 climate talks in Copenhagen, Denmark, to reduce the country's greenhouse gas emissions by 26 percent by 2020, or by 41 percent with international financial backing. In response, Norway's government offered Indonesia $1 billion in exchange for a moratorium on the issuance of new logging permits. Potentially, millions of acres of forests have been spared, but the pace of deforestation has actually increased, despite the moratorium. A recent study found that between 2000 and 2012, more than 6 million hectares (14.8 million acres) of natural forest was lost, an area roughly the size of Sri Lanka. Forty percent of the deforestation occurred within national forestlands where logging is restricted, hinting at the extent of corruption and illegality in the forestry sector. And, despite the current president's moratorium, the highest level of clearing occurred in 2012. Does fighting deforestation make a president 'a puppet'? In the midst of this crisis, the Indonesian presidential campaign has been nothing if not colorful. As of today, it appears that Jokowi is set to win the election, but it is likely that Prabowo will challenge the result in the nation's Constitutional Court. Jokowi, an ardent heavy-metal fan, recently charmed voters by standing in the front row of a Metallica concert in Jakarta. Often compared to President Obama, Jokowi is widely praised for pioneering health care reform for his constituents during his time as mayor of Surakarta. 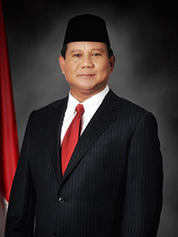 Prabowo Subianto. Photo courtesy of Wikipedia. Prabowo, on the other hand, has strong ties to the former regime, having once been married to the late authoritarian President Suharto's daughter. During his campaign, he has faced frequent accusations of human rights violations, having been linked to the abduction of 23 pro-democracy activists in 1998. Nevertheless, Prabowo has combated Jokowi's grass-roots popularity with carefully orchestrated pomp and circumstance, riding into rallies on horseback in full military regalia and, the Financial Times reported, demanding of his supporters: "Do you want to be led by a puppet?" But despite the significance of the issue, both Jokowi and Prabowo largely neglected deforestation during televised debates, instead making broad promises about reforestation in campaign statements. Former presidential spokesman Witolear characterized the campaign as one "based on personalities," not issues. Frances Seymour, a senior fellow at the Center for Global Development, said framing the Indonesian presidential campaign in terms of climate change "is definitely an international perspective." Most Indonesian voters don't yet appreciate the national self-interests served by reducing deforestation, and talk of climate commitments could be painted by opponents as an example of outside interests having undue influence on domestic policy, Seymour explained. "Elections, historically, have been the time in Indonesia when nationalism has peaked," said Seymour, adding that candidates likely want to avoid the risk of being characterized "as a puppet of international interests." Those concerned about climate change have therefore had to triangulate, based on the candidates' statements on other issues, about which man might be best at slowing the nation's rising deforestation rates and emissions. In the end, most favor Jokowi. Some say Jokowi appears to be stronger supporter of indigenous peoples living in Indonesia's tropical forests, a stance that would afford better protections to the forests themselves. And unlike previous leaders, Witolear said, Jokowi is "very open to NGOs," many of which are actively working with oil palm companies to make their practices more sustainable. Some, such as Hurowitz of Forest Heroes, also believe Jokowi will strengthen the country's anti-corruption commission, which has recently prioritized clamping down on the bribery that runs rampant in the country's natural resources sector, especially at the provincial level. Prabowo, on the other hand, earned a good portion of his wealth from mining, another industry contributing to Indonesia's swift deforestation rates. His even wealthier brother, who backed his campaign and was estimated by Forbes to be worth $700 million in 2013, also has financial ties to palm oil. But Hurowitz acknowledged a belief that is driving many Indonesians to favor Prabowo: The ex-general might be more effective at reining in the power of local officials, many of whom, environmental groups charge, are bribed by companies to give out illegal forest concessions. And for most Indonesian voters, still living in a developing nation, promises to improve the economy trump any concern they may have about the environment. Sumatra's crumbling infrastructure, lack of adequate electricity and potable water, and need for economic development demonstrate why the candidates might avoid talk of climate change and instead focus on boosting Indonesia's gross domestic product. According to Greenomics Indonesia Director Elfian Effendi, Jokowi has set the target of economic growth at 7 percent, while Prabowo wants to achieve an economic growth rate of 10 to 11 percent. "Deforestation will absolutely be involved in the meeting of the both targets," Effendi said in an email. Aidy Steveany Halimanjaya, a research officer in climate finance at Overseas Development Institute in London, also noted that Jokowi's manifesto contained many contradictions. It does mention reducing deforestation, she said, but it also prioritizes energy independence using the nation's coal and gas reserves. Halimanjaya, who is originally from Indonesia, said it is ultimately "difficult to predict" how either candidate will take on climate issues, such as whether the moratorium on logging permits will be continued. Since the downfall of Suharto in 1998, there has been little continuity between administrations on environmental policy, she explained. "Every time there is an election, we have a different person taking power, and everything changes. ... All of a sudden, it can be turned upside-down," said Halimanjaya. "That's the reality in Indonesia." Yet a presidential push for reform in the natural resources sector could be the next great leap forward in Indonesia's transition from military dictatorship to representative democracy, environmental advocates say. While not explicit, this reform might also prove to be the pivotal strategy in reducing Indonesia's deforestation and greenhouse gas emissions, they add. "The opportunity is there for a savvy politician to take advantage of the moratorium to create lasting legal and governance gains for the forest," Hurowitz said. "This presidential election could be the moment when Indonesia seizes the opportunity to dramatically reduce its deforestation."